You don’t have to convince most parents of the benefits of reading. However, lots of people are frustrated in their efforts to get their kids to read—and to enjoy reading. Or to keep reading. Or to read more challenging material. About 20 years ago I became a literacy advocate. I was a freelance journalist and I passionately believed that kids who love to read are better able to discover, explore, grow as an individual and find solace or adventure or fun. Reading is vital. I joined the Trent Valley Literacy Association, a wonderful organization in Peterborough ON that helps people learn to read. I became a literacy tutor and eventually served as president of the organization. But why was my son reading at age three, when so many other kids were starting much later? Sure, a lot of it was probably just his personality. But I couldn’t help wondering if there was something we—as a “reading family”—might be doing as a matter of course that might be planting the seeds of literacy. I was searching for some kind of “holy grail” of literacy. Something that parents could do to ensure that—even if the parents themselves weren’t big on reading—their kids would become passionate readers. I researched. I read books and articles and blogs. I asked questions. I interviewed “reading” and “non-reading” families. I interviewed frustrated parents; I asked them about their reading habits. And when I hit on some good ideas, I asked parents of non-readers to try them out on their kids and I monitored their success. Eventually, I discovered some commonalities. Three big things, and a lot of little things, that parents can do to help turn their kids into lifelong readers. All of the literature says that if there’s only one thing—just one thing—you should do if you want to turn your kid into a reader, it’s this: read to your child, every day. Parents who take even 15 minutes to read to their child are far and away more likely to have a kid who ends up loving reading. So if you’re frustrated because your child doesn’t want to read, spend 15 minutes each night reading to him. Every night. Just 15 minutes. My son’s kindergarten teacher once told me something I’ll never forget. He said, “I know who in my class is regularly read to and who isn’t. When I open up a book to read to the class the kids who are read to, perk up and come closer. They know it’s about to get exciting. The kids who aren’t read to, barely pay any attention to me.” That’s pretty profound. So that’s the first “big” thing parents can do to foster a love of reading. Why? Because kids who are surrounded by books are more likely to be comfortable around books, to feel that they’re part of their natural landscape and to feel entitled to them. And when the time comes, they’ll read. They’ll read because they’ve been around books all their lives—it’s natural and comfortable for them. With this in mind, one of the most wonderful programs in Canada has got to be the TD grade-one book giveaway program, co-sponsored by the Canadian Children’s Book Centre. TD and the CCBC make sure that every Canadian child gets a book of their own, to take home and keep, at least once in their life. Every child. The program reaches kids in every province, at any school, home-schoolers, in remote communities—everyone. (If your child for some reason didn’t get her book, you can contact the CCBC and you can bet they will get a book to you right away.) Last year they gave the wonderful Gifts (Cadeaux) by Jo Ellen Bogart, illustrated by Barbara Reid to more than half a million children. This year it was I’ve Lost My Cat (J’ai Perdu Mon Chat) by Philippe Beha. You may be wondering if one book can really make a difference. Here’s an anecdote told to me by TD’s Alan Convery, who helps organize the book giveaway. He recounts that one year TD received a letter from a school principal in a community in the Northwest Territories thanking him, and letting him know that for most of the children, it would be the first book they would own. And for many of the children, it would be the only Christmas present they received that year. You bet one book makes a difference. By the way, if you’re looking for a sure-fire great book for your young child, take a look at the list of books TD and the CCBC have given away over the past 12 years. Each one is rigorously hand-chosen. Each one is a gem. Let your kids see you reading. This one just makes sense. Kids emulate what their parents do, especially in the early years. So if your kids notice that you’re reading, they’ll be more likely to consider it a normal and worthwhile activity. Of course, it means putting yourself on display a bit more; moving your reading activity out of your bedroom and into the living room. Put some magazines downstairs and read the newspaper at the breakfast table. Be a reader to make a reader. There are many more things parents can do to help their kids become readers—which is why I started a blog called Getting Kids Reading. 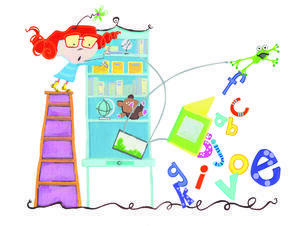 There you’ll find literacy activities, games, online resources, research and great books that will help your child be—and remain—a passionate reader. In the meantime, if you’re a parent who wants to do one thing? Read to your child, every day. Before you know it, you’ll have a reader on your hands. Joyce Grant is a freelance journalist and a children’s literacy advocate. In 2010 she co-founded the website TeachingKidsNews.com, which offers free, daily, kid-friendly news. 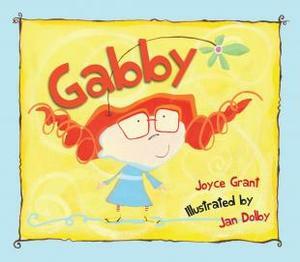 This year her first children’s picture book, Gabby, was published by Fitzhenry & Whiteside (illustrated by Jan Dolby). Gabby launches in Toronto this Sunday!